Faber-Castell Design Memory Craft Giveaway! Faber-Castell, a company whose name I've long associated with quality art products, has developed a product collection called Design Memory Craft. 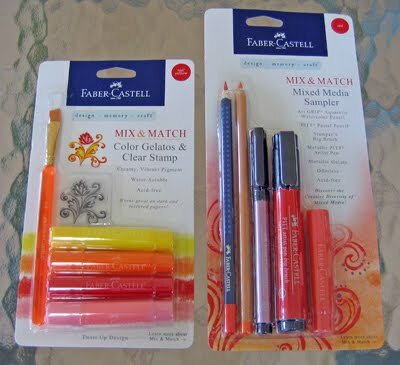 Mix and Match Color Gelatos, Stamper's Big Brush Pens, Art GRIP Aquarelle Watercolor Pencils, PITT Pastel Pencils, and Metallic PITT Artist Pens provide a fine selection from which to choose. The variety of color palettes and mediums make it very easy to try one's hand at new techniques. Color Gelatos are just plain fun to use... they come in mess-free tubes from which creamy color swivels up, similar to a lip balm stick. The opaque product glides easily across the paper leaving a trail of glorious color, and is odor-free, acid-free, and non-toxic. Most of the Gelato sets include a paintbrush with a triangular handle that prevents it from rolling off a work surface - love that! - as well as a floral clear stamp. The MIX & MATCH Mixed Media Sampler contains a metallic Gelato, along with a Stamper's Big Brush Pen, Art GRIP Aquarelle Watercolor Pencil, PITT Pastel Pencil, and Metallic PITT Artist Pen, all in a coordinated color palette. Color Gelatos are packaged in a variety of color combinations, including black and white, silver and gold metallic, colored metallics, neutrals, blue/green, and red/yellow, which is the collection I received. The colors can be blended with your fingers - it washes right off - or transformed into a watercolor painting by stroking the colored paper with the dampened brush. 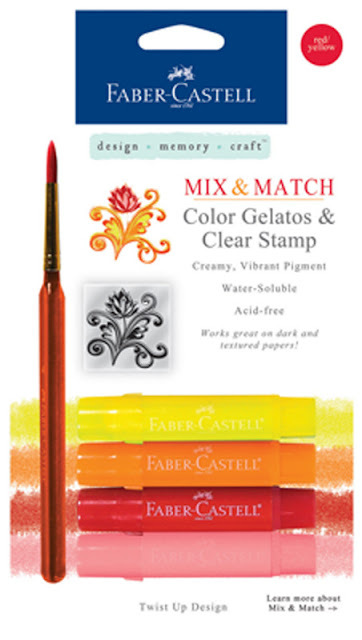 The product information suggests coloring the clear stamp with a Gelato for traditional stamping, or coloring paper with a Gelato first, and then using the stamp to remove some of the color. 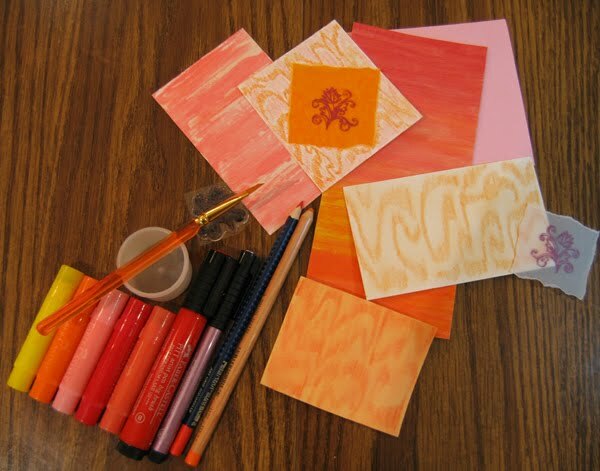 I have to say I didn't have a lot of success with either of these methods (although adding water may have done the trick), but instead enjoyed using the color sticks to create card backgrounds. I created the striped effect on this card with a pink Gelato, coloring over that first layer of color with a coral metallic Gelato on matte finish photo paper. I love that the paper's slick surface resulted in crackles, giving a weathered look.. 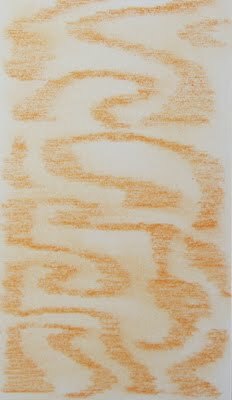 In this case, the surface needed to be sprayed with a fixative to preserve it, but when using Gelatos on regular, textured, or flocked paper, the color stays firmly put unless water is applied. I've been an avid doodler since way back... well, actually more of a scratcher. In school I would fill the margins of notebooks with little V-like scribbles. I still do it to this day while on the phone or at a meeting, so to test out each of these pencils, I set to work making backgrounds for cards using variations of my johnny-one-note scribble skill. Don't the squiggles give the effect of wood grain? Maybe a tiny bit? Humor me. Wood grain is very popular in the stamping world at the moment and I enjoy being in style. 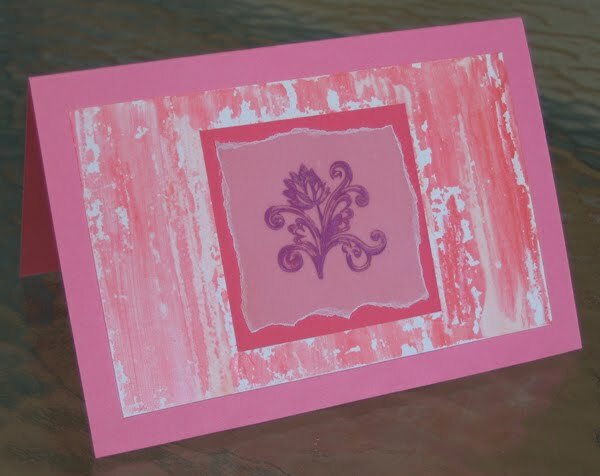 For this bookmark I used the purple Metallic PITT Artist Pen (India ink) on photo paper. The ink has such a nice shine in real life and the color doesn't budge once it dries. 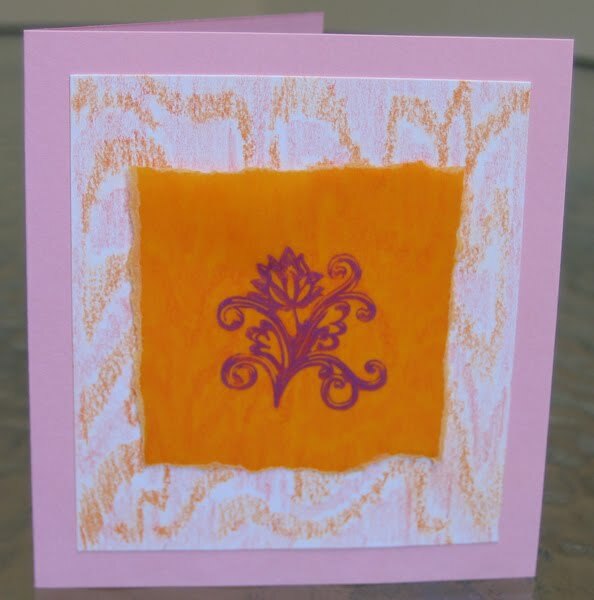 I found that the Metallic PITT Artist Pen also did a wonderful job of inking the clear stamp, which I stamped on orange vellum to create this card. The pink and orange background was done with an Art GRIP Aquarelle Watercolor Pencil and a PITT Pastel Pencil on white cardstock. And then just because I'm first and foremost a quiller, I felt compelled to try my hand at recreating the flourishes on the clear stamp... a quillable design if ever I saw one! The background was more squiggles, this time on pale yellow cardstock with the Aquarelle Watercolor Pencil to which I applied a bit of water via the paintbrush to blur the lines. The Design Memory Craft site has lots of information and also a blog where you'll find many more ideas for using all of these tools. Faber-Castell sent me the supply sets pictured above for review purposes, and is offering two All Things Paper readers (U.S. or Canadian residents only; so sorry, all of you international folks) the chance to win the very same sets (color selection may vary). Leave a comment to enter. If you would like additional chances to win, just spread the word about the giveaway via your blog, Facebook page, Twitter, and/or any stamping/scrapbooking forums you might belong to, and tell me if you've done so in your comment. The giveaway ends at the end of this Friday, April 29, and winners will be selected at random and announced the next day on this post. Good luck! And the winners are: Congratulations to Deb Plapp and Aurora! They were chosen by the random.org number generator. Faber-Castell's contest organizer will see that you each receive your art supplies - I hope you'll enjoy using them! Thanks everyone, for all of the lovely comments and for spreading the word about the giveaway. Playing with these would be such fun...pick me!! Thanks so much. Love love your tutorials. I love to play with new things...and I'm in the mood. Are these in art stores now? sudukc - Yes, they are! love the back grounds, it's cool how you can make so many designs. love your quilling to, they go well together!! I so want a set of these wonderful items! I have only heard great things about them and I must try them out ... but can't find them in stores!!! At least near me ... would love to win the sets! Love how you merged the quilling with the background!! They look very fun to play with. What a wonderful giveaway! I can think of the mother's day card I'd make with them. Those look like so much fun! Pick me, pick me! Ooh these are gorgeous and yes wood grain definitely.. didn't see these when I was looking for new things either.. I shared this on my blog and on my Facebook page.. It does look lovely with the quilling too.. when are you going to try tangling???? you will love it.. The first thing I thought about your creation was that it looked like wood grain. Nice work! The new products look like lots of fun. I'd love to try them out and would love even more to win them! Thanks for the opportunity! I love that some of these products are being offered as "sample packs"! I wish more companies would do that. Tahnks for the info - I will have to get some of these to play around with! Great projects. I am a huge fan of Faber-Castell artist pens and brush markers. I love to scenery images around stamped images and watercolor. Thanks for the opportunity to win this fun product. Great giveaway. I'd love to win. I'll post about it on my blog too! Oh the fun I could have with these! Can't wait to get my hands on them! Oh I have heard about these and have been dying to try them! Just tweeted it too! I haven't seen these in stores here yet! The sets look like they offer alot of new things to try out! I've heard that these products are wonderful. Please count me in and thanks! Wow, interesting products! Love how you made such cool backgrounds. good luck everyone!!! In case you need to contact me because I won: cre8now@att.net thanks for the opportunity!! I'd love a chance to win these! Wow, nice gift! Thank you so much for the opportunity to win this! Saw this on Kate's blog....I would love to win. Thank you so much!! These look really intriguing. I'd love to try them out!! What a great giveaway! I love how you merge your quilling and backgrounds together! Thanks so much! I love my Pitt India ink pens. The Gelato medium is intriguing. Great new product!! I would love to try it out.Thanks for the chance to win!! I love new products! Hope to win! Your samples are gorgeous! Would love to win a set and try out these fun looking products. what fun, i'd love to be enterd to win!! I love the way your quilling turned out with the background. I could use a set of those myself. 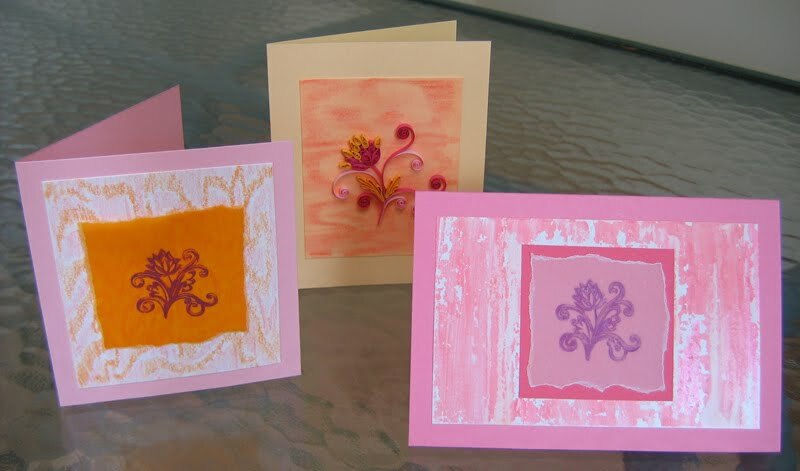 i'm not commenting for the give-away (even tho would love to :)); the quilled card is wonderful, love the color & the swirls! Thx for giveaway. One cannot have too many of such supplies. Love your backgrounds and quilling...I have a few of the Aquarelle Watercolor Pencils but have never tried to do backgrounds - will be playing with them for sure! Not familiar with the other products, but would LOVE to win and give them a try!!!! Thank you Faber-Castel for the chance! I would have a blast with these!! Ty for the chance to win them! Those gelatos look wonderful! I'd love to give 'em a whirl. These are so nice!!! Would love to win! What a generous give-away! Thank you so much for the chance to win! This looks like some great products that I will have to try. I'd love to experiment with these products! Love your blog, also. I'm a faithful reader. I've wanted to try these since I first saw them advertised. I saw Suzi Blu using them, and now you're using them for a totally different effect. They look awesome! Love the super creamy colors! Your backgrounds are neat looking. Who knew scribbles could look so artsy? I could have so much fun with these products! Thanks for the giveaway! My obsession with paper runs as deep as the Mississippi. PLEASE! I love crafting! I'd love to win these!! Ooh la la! What a great package for the nifty crafter!! Love their products and what great cards! Thanks for the chance to win. Wonderful BG's you created! Thanks for the chance to win! These look like great fun. Would love to give them a try. I'm for multi-media! I'm learning so much from everyone. Feel like a newbie all over again when goodies like these come out. I'll share on facebook, Justcards and Cards yahoo group. Your creations are beautiful. I would love to play with these mediums. Pick me, LOL. Looks like I could really makes some pretty things with these! I love these, I hope to find them in my art supply store! I love the ideas you've posted here. What a great crafting resource! Would love to try these! Thanks! This look like many happy hours of creativity! I would absolutely love the chance to work with this!!! I love trying new products and love to make cards!!! I have five kids who are into it just as much as I am!!! I love your creativity. Sometime would you share how long it takes you to complete an average project? Thanks for a chance to win! Thanks Carol! 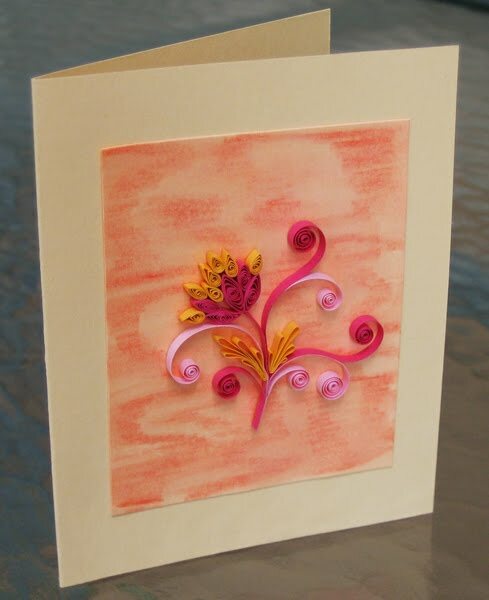 A stamped card can be made pretty quickly, but if I add quilling, I usually spend an an afternoon or evening on one. These are so cool! I'm a letter writer, so I'm always looking for something to snazz my stationery up with. Never having worked with any of these products I would love to win them! OMG, these are fabulous. I had a chance to play with these at a class I took, and they are amazing!!! ooopss. I shared on FB as well. Thank you! I tweeted about this too! But I don't want anyone else to enter because I want to win! hehehe! These are so cool...would love to win them ! I've seen these products around and they look like such fun! fab giveaway :) would love a chance to use them! i've just uncovered a lost stash of papers and this would be a wonderful way to use them up! I have been hearing so much about these lately. Thanks so much for the chance to win! The giveaway has ended. Thanks to you all for your lovely comments and for spreading the word about the giveaway! Thank you again. i can't wait to try these out!